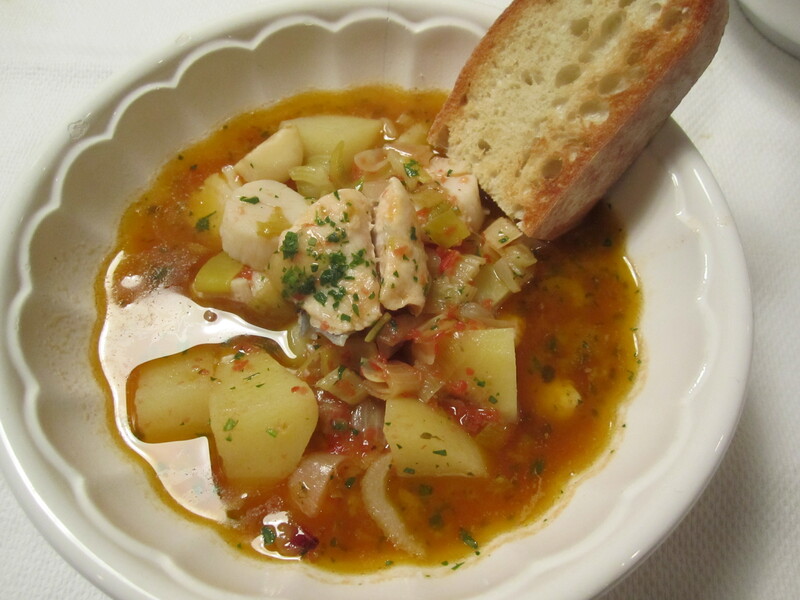 This soup can be made with a variety of different types of fish and seafood. I picked the ones that were caught locally and that I liked. Today’s soup had scallops, fluke and john dory. 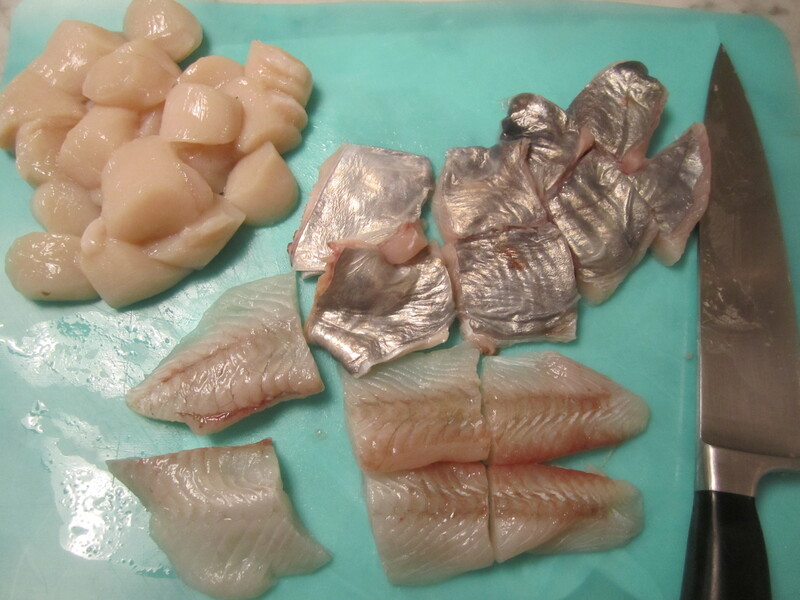 John dory has a silky texture and a delicate silver skin; fluke cooks very quickly and flakes easily; scallops add sweetness and brininess to the broth. All three of these ingredients cook at relatively the same rate, which is important. The technique would be the same regardless of what varieties of seafood you were using. 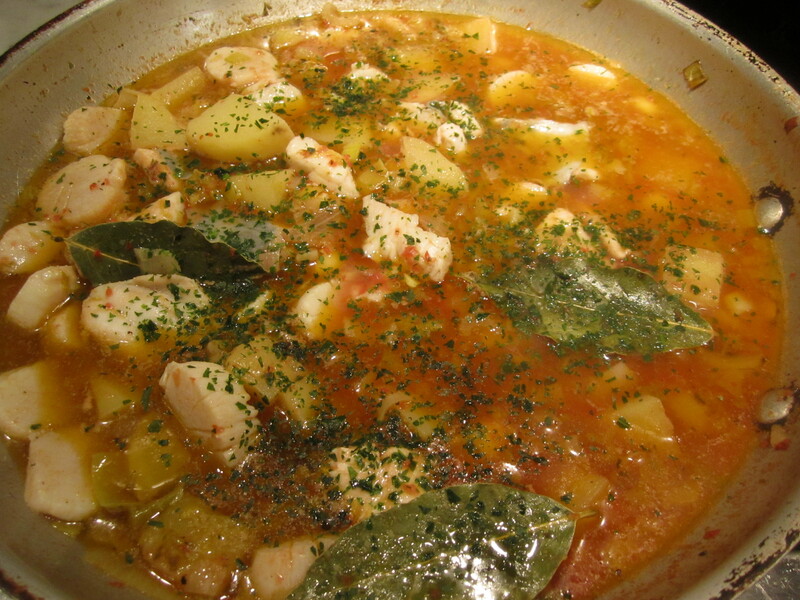 Saute the aromatics and potatoes, then add wine, then broth and pureed tomatoes. Let the broth simmer for about 8 minutes (or until potatoes are cooked through). Then add the seafood and simmer for another 6 minutes or so. This dish is deeply rich and satisfying but relatively light, making it the perfect meal to eat during the holidays, when everything is over-the-top rich. It’s also very quick to prepare (it takes no more time than boiling pasta). All that is necessary as an accompaniment is some fresh hot crostini, drizzled with olive oil. 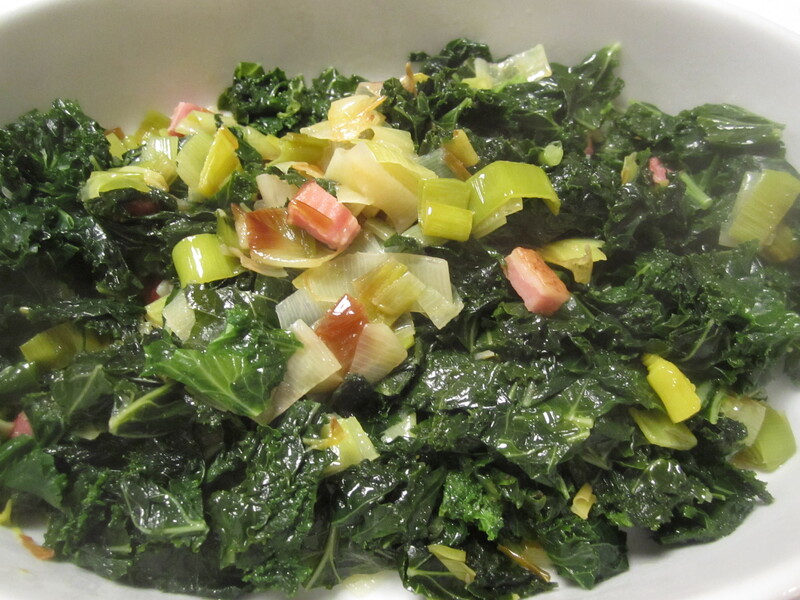 As a side dish, we had kale, sauteed with leeks and bacon (there had to be a little bacon in the meal!). 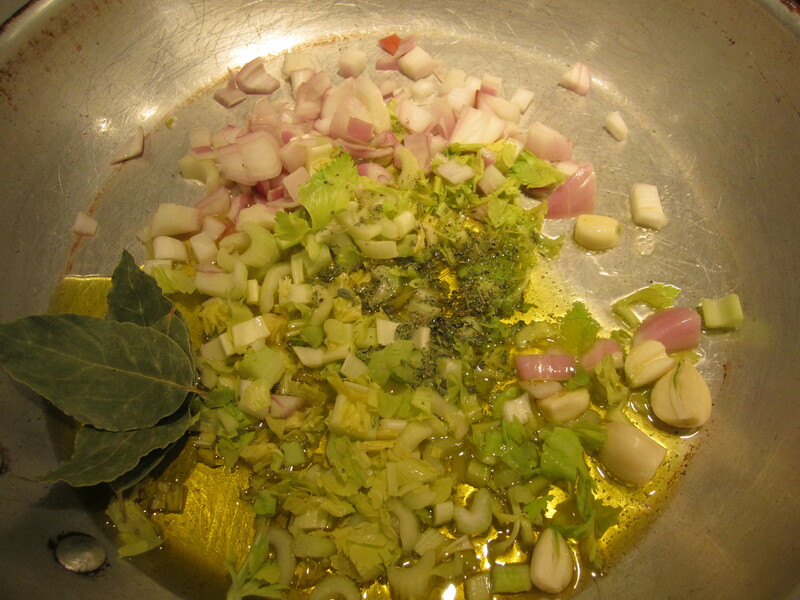 In a large skillet, place oil, shallots, leeks, potatoes, bay leaves, and oregano. Turn heat to high and saute for about 8 minutes, or until the mixture begins to turn golden. Add wine and reduce for a minute. 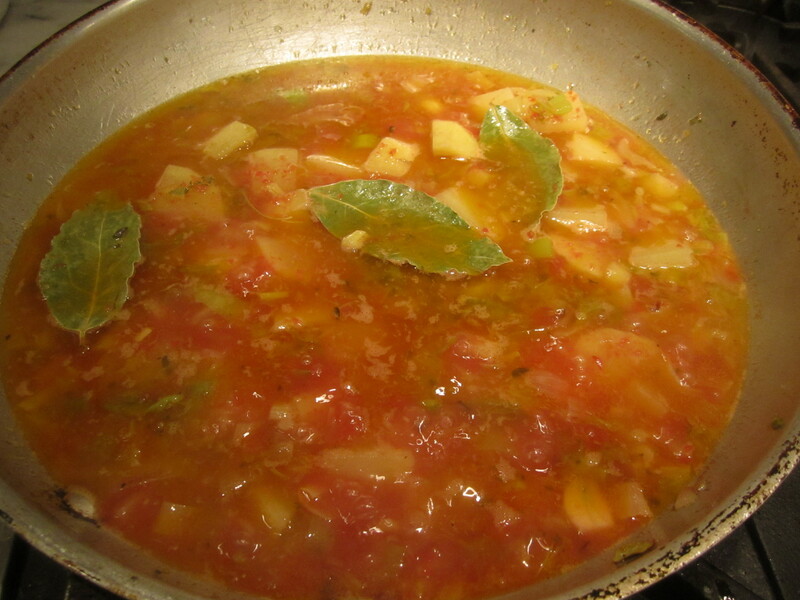 Add tomato, broth, and simmer for about 6 minutes, or until potatoes are just cooked through. Taste and add salt and pepper. Add fish and seafood and cover. Turn heat to medium and simmer for about 5 minutes. Uncover and simmer for another minute, or until all is cooked through, then sprinkle with parsley. Serve immediately in heated bowls with freshly toasted bread drizzled with olive oil.